Recently I have been working with another technique which is commonly used by Software Engineering People but mainly for Software Architecture: Quality Attribute Workshops (QAWs) from CMU SEI (Carnegie Mellon Software Engineering Institute. This technique make use of interactive workshops with the main stakeholders of a project. Where you the solution is to be developed either internally or externally (not a COTS), then this technique could be combined with the Business Scenario. The TOGAF specification considers the Enterprise as a System, however the term System in QAW is more related to IT Systems. QAW provides an opportunity to gather stakeholders together to provide input about their needs and expectations with respect to key quality attributes that are of particular concern to them. A similar concept to what we try to achieve with the TOGAF Business Scenario but with a focus on IT systems quality attributes. It is also a purpose of identifying scenarios from the point of view of a diverse group of stakeholders which can then be used by the system engineers to analyse the system’s architecture and identify concerns. QAW is mainly addressing non-functional requirements and there is still needs to understand the problems we try to solve, gather functional requirements like in Business Scenarios. Quality Attribute Workshops ensure that quality attribute scenarios are identified, prioritized, and refined before the software architecture is completed. Individual requirements are viewed in a forum in relation to one another in the context of the overall problem. Architecture is based on complete set of requirements that add up to a whole problem description. During the workshops the Stakeholders receive a “participant’s handbook” providing example quality attribute taxonomies, questions, and scenarios. Below are the steps of the QAW. Business and/or mission drivers for the system (goals and drivers), plan, strategies, high-level functional requirements, constraints, artifacts and quality attribute requirements should be presented to the stakeholders. Using Business Scenario in conjunction with QAWs can be an appropriate approach. These elements may also be produced in a Business Scenario or produced later in the ADM phases A : Architecture Vision, C: Information Systems Architectures (stakeholders management and taxonomy of artifacts). Quality attribute requirements are the means by which a system is intended to meet its business goals and QAW helps to document them. Software architectures must be designed so that their quality attributes are met. The QAWs technique can be utilised as a complementary approach to gather all sort of requirements including those from Software Architectures when appropriate. One of the responsibilities of an Enterprise Architect is to provide complete traceability from requirements analysis and design artefacts, through to implementation and deployment. Along the years, I have found out that the term traceability is not always really considered in the same way by different Enterprise Architects. In Enterprise Architecture, traceability may mean different things to different people. The TOGAF 9.1 specification rarely refers to traceability and the only sections where the concept is used are in the various architecture domains where we should document a requirements traceability report or traceability from application to business function to data entity. In this diagram, we show the relationships between the components from the four architecture domains. Changing one of the components would allow doing an impact analysis. Using the TOGAF 9.1 framework, we would use concepts of the Metamodel. The core metamodel entities show the purpose of each entity and the key relationships that support architectural traceability as stipulated in the section 34.2.1 Core Content Metamodel Concepts. So now, how do we build that traceability? This is going to happen along the various ADM cycles that an enterprise will support. It is going to be quite a long process depending on the complexity, the size and the various locations where the business operates. You will probably document your architecture with the use of word processing, spread sheets and diagramming tools and store these documents in a file structure on a file server, ideally using some form of content management system. Individually these tools are great but collectively they fall short in forming a cohesive picture of the requirements and constraints of a system or an enterprise. The links between these deliverables soon becomes non manageable and in the long term impact analysis of any change will become quite impossible. Information will be hard to find and to trace from requirements all the way back to the business goal that drives it. This is particularly difficult to achieve when requirements are stored in spread sheets and use cases and business goals are contained in separate documents. Other issues such as maintenance and consistency would have to be considered. Many enterprise architecture tools or suites provide different techniques to support traceability but do not really describe how things work and focus mainly on describing requirements traceability. In the following example, we use a traceability matrix between user requirements and functional specifications, use cases, components, software artifacts, test cases, business processes, design specifications and more. Mapping the requirements to use cases and other information can be very labor-intensive. Some tools also allow for the creation of relationships between the various layers using grids or allowing the user to create the relationships by dragging lines between elements. Below is an example of what traceability would look like in an enterprise architecture tool after some time. That enterprise architecture ensures appropriate traceability from business architecture to the other allied architectures. The TOGAF 9.1 core metamodel provides a minimum set of architectural content to support traceability across artifacts. Usually we use catalogs, matrices and diagrams to build traceability independently of dragging lines between elements (except possibly for the diagrams). Using catalogs and matrices are activities which may be assigned to various stakeholders in the organisation and theoretically can sometimes hide the complexity associated with an enterprise architecture tool. Using artifacts creates traceability. As an example coming from the specification; “A Business Footprint diagram provides a clear traceability between a technical component and the business goal that it satisfies, while also demonstrating ownership of the services identified”. There are other artifacts which also describe other traceability: Data Migration Diagram and Networked Computing/Hardware Diagram. Another possibility could be the use of the ArchiMate standard from The Open Group. Some of the that traceability could also be achievable in some way using BPMN and UML for specific domains such as process details in Business Architecture or building the bridge between Enterprise Architecture and Software architecture. The example from the specification below documents the various architecture layers. As you will notice, this ArchiMate 2.0 viewpoint looks quite similar to the TOGAF 9.1 Business Footprint Diagram which provides a clear traceability between a technical component and the business goal that it satisfies, while also demonstrating ownership of the services identified. Another example could be the description of the traceability among business goals, technical capabilities, business benefits and metrics. The key point about the motivation extension is to work with the requirement object. Using the motivation viewpoint from the specification as a reference (motivation extension), you could define business benefits / expectations within the business goal object, and then define sub-goals as KPIs to measure the benefits of the plan and list all of the identified requirements of the project / program. Finally, you could link these requirements with either application or infrastructure service object representing software or technical capabilities. (Partial example below). One of the common questions I have recently received from various enterprise architects is “Now that I know TOGAF and ArchiMate… how should I model my enterprise? Should I use the TOGAF 9.1 artifacts to create that traceability? Should I use ArchiMate 2.0? Should I use both? Should I forget the artifacts…”. These are good questions and I’m afraid that there is not a single answer. What I know is that if I select an enterprise architecture tool supporting both TOGAF 9.1 and ArchiMate 2.0, I would like to be able to be able to have a full synchronization. If I model a few ArchiMate models I would like my TOGAF 9.1 artifacts to be created at the same time (catalogs and matrices) and if I create artifacts from the taxonomy, I would like my ArchiMate models also to be created. Unfortunately I do not know the current level of tools maturity and whether tools vendors provide that synchronization. This would obviously require some investigation and should be one of the key criteria if you were currently looking for a product supporting both standards. This other possibility requires that you have an up to date Configuration Management Database and that you developed an interface with your Architecture Repository, your enterprise architecture tool. If you are able to replicate the relationships between the infrastructure components and applications (CIs) into your enterprise architecture tool that would partially create your traceability. Achieving traceability within an Enterprise Architecture is key because the architecture needs to be understood by all participants and not just by technical people. It helps to incorporate the enterprise architecture efforts into the rest of the organization and it takes it to the board room (or at least the CIO’s office) where it belongs. · Describe your traceability from your Enterprise Architecture to the system development and project documentation. · Review that traceability periodically, making sure that it is up to date, and produce analytics out of it. If a development team is looking for a tool that can help them document, and provide end to end traceability throughout the life cycle EA is the way to go Make sure you use the right standard and platform. Finally, communicate and present to your stakeholders the results of your effort. Quite often as an Enterprise Architects we are asked to show what the deliverables of an Enterprise Architecture program are. TOGAF provides a methodology for analyzing your specific situation and turning that analysis into deliverables and actionable artifacts. Artifacts may have different shapes as defined in TOGAF 9. They may be: Catalogs, matrices or diagrams. EA artifacts may also help to define a standard set of document types such as education, strategy, decision, policy, standard, guideline, etc. It is also recommended that you set up a simple online discussion thread or wiki for each artifact to solicit feedback from artifact consumers. 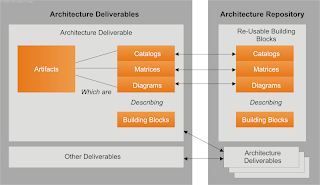 Enterprise Architects should ensure that their efforts to create architecture documentation produce meaningful results by creating artifacts that connect with the consumer, drive decisions, and will allow the development of reusable building blocks. If we consider the various architecture domains, they may have different forms. in Business Architecture, they could be the views of the Business stakeholders. The matrices between business strategy and the main business functions. The diagrams showing the relationship between processes and information. The Value Chains. Business and Operating models of the Enterprise. Customizing the configuration of the Business Functions according to model — and more. The artifacts for Data or Information architecture may refer to an information map or diagram . It could also show the mapping between data items and the Business Information map. Artifacts for Application Architecture, could show the key interconnections between applications, middleware connection matrices. There may also exists views for Portal Architecture, Enterprise Content Management , Identity management, Business Intelligence, ERPs and CRMs. Last but not least, Technology Architecture artifacts may propose servers and storage technology diagrams, office views (file, printing, data base servers, etc…), LAN/WAN/Voice Network architecture diagrams, applications and interconnections mapping to technology servers and networks, infrastructure security diagrams. In addition to that, there may be a certain numbers of artifacts related to the company’s organization, organization chart, lines of business mapping to business functions, organization roles in organization units and job descriptions. Many graphical tools may aid to develop diagrams or document matrices but may also be quite costly. The use of spreadsheet may be a first step in building artifacts such as matrices. The following examples illustrate how they may simply be build with Excel. These are very basic example of what artifacts may look like. They may rapidly be created and are definitely a way to explain to the EA stakeholders how the first deliverables of our baseline architecture looks like.